Viewing a thread - Miss Belevedere to be restored ! Miss Belevedere to be restored ! Subject: RE: Miss Belevedere to be restored ! Isn't it strange that Manning knows what I was talking about even though I didn't? All in fun Mr. Nathan. I'm not psychic or anything, Lawrence... I just scoured the thread for a link to SOMETHING. That's when I found that link MoparsRule! put up, watched the clip all the way through, and there it was! A quick clip of what appears to be BrAin CoPPer stroking his machine. Don't get me wrong, though... It still scares the bejesus outta me that I actually knew what YOU were talking about. What's this world coming to? Location: .Norfolk..Mafia.. ,England UK Well i Know One of you is Joking and having Fun, But i am d@mned if i can work out Which..!!!!!!!!!!!!!!!!!!!!!! Location: dunbar , wv has ultra one got the car yet ? im curious to see what some of its gonna look like derusted ??? i hope some of it comes out lookin good . i dont think running is gonna happen . I am wondering too, I read earlier that the '57 Plymouth was supposed to arrive at ultra one by December 3. It is the sixth and still no word. Location: bishop, ca ..."STROKING his machine"? Did he also look to be BORED? It took a little longer...they had to stop and pickup parts along the way...ooops something else fell off...that or it blew away in the wind...dust to dust. Location: Warren, Michigan It must have gotten caught in the rain on the ride over and melted. All someone needs to do to obtain the car is scoop up the puddles leading to NJ, dry them out, and fill the urn with the remaining dust. Location: .Norfolk..Mafia.. ,England UK Here is the Latest from their Web FORUM..
That's good to hear. Glad she made the trip successfully. I have wondered the condition of Belvederes body. I saw 1 picture where there was kinda paint under that mud. But is it badly rusted? The running gear is might be gone, but I hope the engine will run. I have been wondering these things several months. Just hoping that everything goes well, and we have something to look when De- Rusting progress is over. Well she is very weathered from her long life in all that water and OK mud but there are high hopes for her. We have at this time only been documenting her current state very carefully. At closer look she seems to have quite a bit of paint on her and her chrome seems to be more intact then originally thought. I will keep you posted and hope to have some photo's up very shortly. Location: .Norfolk..Mafia.. ,England UK Here is a Shortcut Link.. Location: Hell's Outhouse - a.k.a. Buckeye, Arizona Thanks for the update, Clive. planning to DESTROY a priceless historical artifact, for nothing more, than for your own financial and promotional interests?" d500neil - 2007-12-11 6:27 PM Why do I not have the moral courage to write the following to them: "You do understand and acknowledge that you are planning to DESTROY a priceless historical artifact, for nothing more, than for your own financial and promotional interests?" It's because you know they will delete the post as soon as you put it up there. Location: bishop, ca Well, I dunno....it seems like I'm just beating a dead caballo....[that's 'horse', for the non-spanglish-speakers, here]. C'mon, Clive; you do it! Location: Mishawaka, IN. Yeah Clive do it man post that for Neil and see if they do delete it or respond. Just in case any of you are looking for the best close up views of the '57 Plymouth, click here. No they are not the most recent views of the car but it has clear up close views including the rusted through spots as well as the crack near the right tailfin. However, if you look on the passenger side lower control arm, you can see a little bit of exposed metal from the car being hoisted out of the crypt. Clearly shows the control arms/front end components are still in excellent shape. Also on the trunk door you can see some of the outer layer chipped off, revealing the sheet metal inside (hard to tell if it is good or bad though), so I also think some of the light brown stuff on the outer panels are just mud. 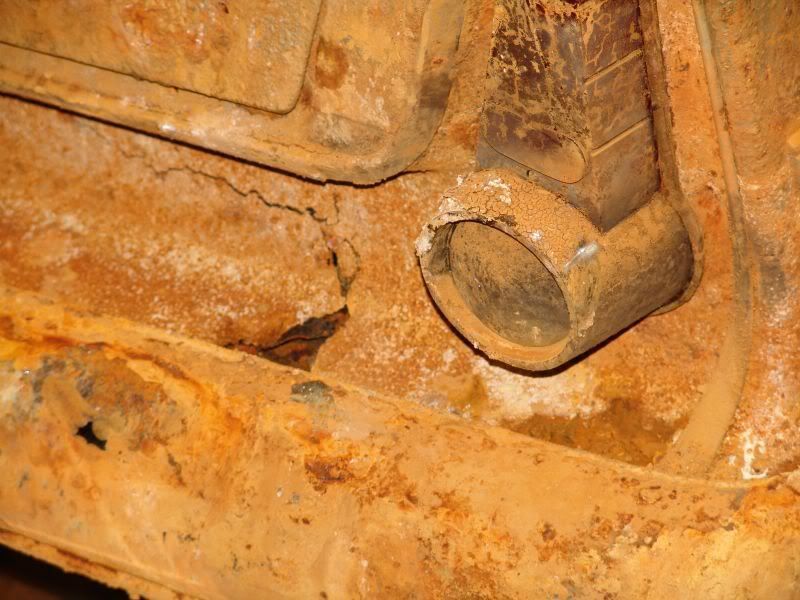 The small holes are mostly on the brown rusted through spots as well as dark brown patches such as the panels behind the rear bumper, behind the rear window, lower panels where they are in the water longer, etc. Location: bradenton florida I heard Boyd was going to use whats left of it to fill the hole in the salt flats he dug. Location: Auckland, New Zealand. I found my way to the site and there are a heap of photos to look at. I didn't notice that in Tulsa!! I found my way to the site and there are a heap of photos to look at. Thanks GLENN.............. Got to see them Now , The close up that Larry mentions i also hadn,t noticed, Most of the Others are the same as i have.. .. Nice to see though .. Location: bishop, ca Could someone kindly PM me the site reference? Could someone kindly PM me the site reference? Well, Charlie got memorialized, in a close-up photo! As far as the CAR is concerned: I see nothing that a little of "ULTRA-F-Up" can't restore, to get that OEM appearance back !!!! Location: Mishawaka, IN. Isn't that the truth, Ultra none is doing a major injustice to Tulsa history and the dorks from maryland are allowing it to be done for a little fame and the all mighty buck of coarse. Location: Bama I haven't seen any current pics. Has anyone else? Location: bishop, ca It's not Halloween, yet, I don't need to get the shiit scared out of me! OR, to quote some "Military Intelligence" , from a recent event : "We had to DESTROY the village (car) in order to SAVE it." Location: Akron, OH / Maricopa, AZ I just have to believe that when they pull it out of the dip tank or however they do it, they will regret they ever got involved. I hear they have some want ads out for a rust-free 57 hardtop body and chassis. No the car won't be dipped into a large vat but by section according to Ultra One but I am not surprised they posted a wanted ad for a rust free body/chassis! I read somewhere that one could easily poke his/her finger through the body panels on Miss Belvedere. Is that true? OUT of the vault, but, rather what Ultra-None DID, to the remains of the car, that came out of the vault. Location: Akron, OH / Maricopa, AZ Neil, the word is that they are only going to have to install one patch panel ... the entire body. But: the glass & tires are PRIMO! Location: Mishawaka, IN. Yepper isn't that the truth, they think they can fool all of us. Ha we as a group have more close in pictures of that Plymouth, then I think they realize, and we will be the first to call there fraud. If they try switching bodys. Yeah replacing everything means it isn't the same car that was unburied from the vault. Virtually only the trim are in excellent shape. The only reason Miss Belvedere was still presentable was because it was under water which helped keep the shape. I imagine if somehow air got in long before they opened up the vault, the car would have turned to dust, leaving only glass, rubber, thick metal parts, etc. At least they may somehow get a Response, Cos that Site ain,t saying $HIT... !!!!!!!!!!!!! 2. Few pics on the Ultra-One website of the Process beginning, then nothing. 3. Word comes that the Process is taking a bit longer than expected. 5. Lots of finger-pointing, charges, threats of lawsuits, etc. car outside where is deteriorates. 8. The sorry end to a car that brought so many people together. Location: bishop, ca YO ! "I wouldn't do anything to it. I'd just put her under glass in a museum and keep her just like she is." For one brief moment, it seems that ol' Cobble-ton may have been right about something!